Last year, I wrote about removing everything from my travel kit that charged over micro-USB. 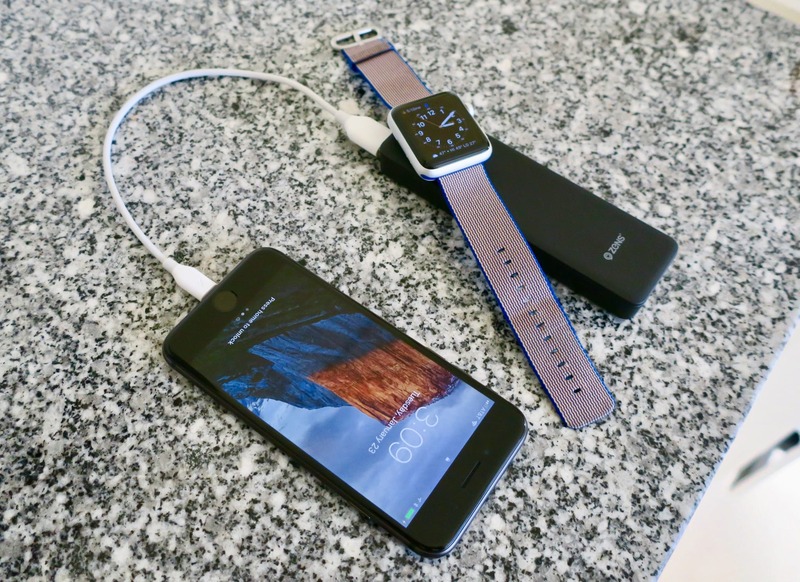 My iPhone and iPad charge over Lightning, why can’t everything else? It was a neat idea that worked well. At least, for the most part. The two biggest hurdles were in finding a way to charge my Apple Watch and tracking down a power bank that featured a Lightning port. If you read my piece from last year, you may remember that I discovered that Aukey offered an external battery that charged over Lightning. It was a neat product — it didn’t have much capacity, but it was more of a safety net than anything else. I didn’t need a giant battery to charge all of my devices at once, I just wanted a compact unit that I could use to top-off my iPhone in a pinch. The Aukey has a couple of other downsides, though. It often got warm while in use and it took, what seemed like, forever to charge. That’s not something I would normally complain about, but when you’re leaving on a trip the following morning, it’s nice to have everything actually packed the night before. With the Aukey, I would often have to leave it to charge overnight and risk forgetting it in the morning. That brings me to the other hurdle associated with an all-Lightning lifestyle — charging my Apple Watch. Up until a few months ago, my solution was to just leave my Watch at home when I traveled. This worked out okay for a while — I would have those moments where I’d look down at my wrist for the time and realize I’m not wearing it, but I didn’t miss it much. That is, until last Fall when I made an attempt to better utilize the Watch in my daily life — which manifested itself on this site when I wrote about my favorite watchOS apps. My newfound love for the Apple Watch made it much harder to leave home without it. But I didn’t have a great solution for charging. I brought my Watch’s charging cable a few times, but I hated having to bring a dedicated cable that serves no other purpose than to charge my Watch. Then I stumbled across this nifty Zens Power Bank. It doesn’t charge over Lightning, but it features an Apple Watch charging pad and a USB port for powering my iPhone, iPad, or AirPods. I could leave my Watch charging cable at home and replace the Aukey battery with this Zens model. I’ve had the Zens Power Bank for just under two weeks and I’ve been very impressed so far. The hardware feels study, without being too heavy, and the outer casing has a grippy coating to it. This material makes it easy to carry and helps prevent the unit from sliding off of surfaces or slipping out of pockets in a bag. Before purchasing the Zens I was little worried about whether the magnets in the integrated Watch charging pad were going to be strong enough. I didn’t want my Watch to be easily knocked off of the Zens, especially since I was going to be using it for travel where I wouldn’t have the familiarity of my home’s bedside table. I just imagined setting my phone down for the night and accidentally bumping my Watch off of the charger without realizing it. Luckily, the folks at Zens must have considered that possibility because the charging pad’s magnets feel stronger than those in Apple’s own charging cable. To test their strength, I tried holding the battery upside down with my Watch attached to it. The magnets were powerful enough to maintain its hold on the Watch, even with a bit of shaking. I have no worries, at all, that my Watch will get bumped off the charger. 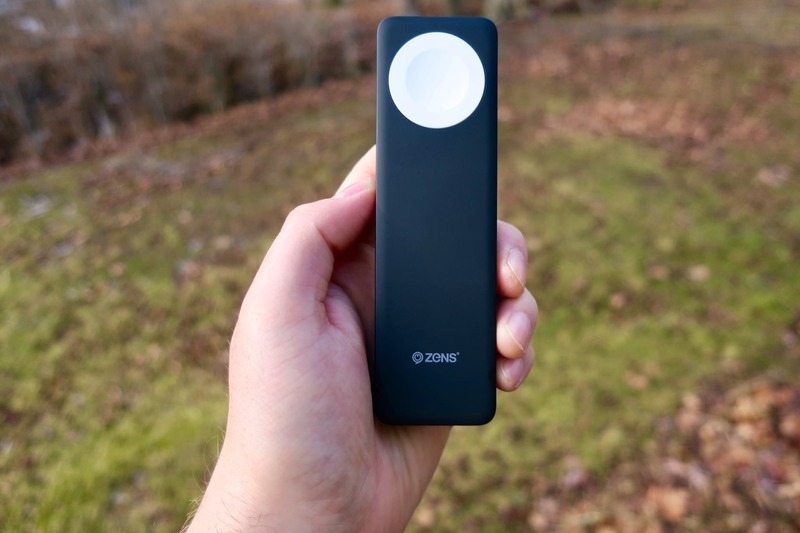 The Zens Power Bank has a 4000mAh capacity — the product page says that it should offer up to ten full charges of an Apple Watch or two charges of an Apple Watch and iPhone simultaneously. This is a great capacity for me. I can take the Zens on a weekend trip and charge my Watch every night without having to bring the Watch’s charging cable. And on the way home, the Zens will still have enough power left to top-off my iPhone in a pinch. The power button, USB, and micro-USB port are located on the small edge of the Zens, right next to the Watch charging pad. And it features a small, dimly-lit LED that indicates how much charge is left in the battery — blue is 90-100%, purple is 20-90%, and red is 0-20%. I wish there was an additional color to indicate charges below 50%, but there are so many benefits to using the Zens that I can forgive this little annoyance. As for the Zens’ use of Micro-USB and my interest in keeping my travel bag Lightning-only, I don’t plan on charging the unit’s battery when I’m away from home. The Zens will be, primarily, used to charge my Apple Watch while traveling and will only be used to power my iPhone if I’m stuck in some unforeseen circumstance away from a power outlet. And even then, if the Zens is only able to provide my iPhone with one full charge, that should be more than enough to get me by. I can still leave my Micro-USB cables at home without worry. I own a handful of power banks and the Zens is by far my favorite. 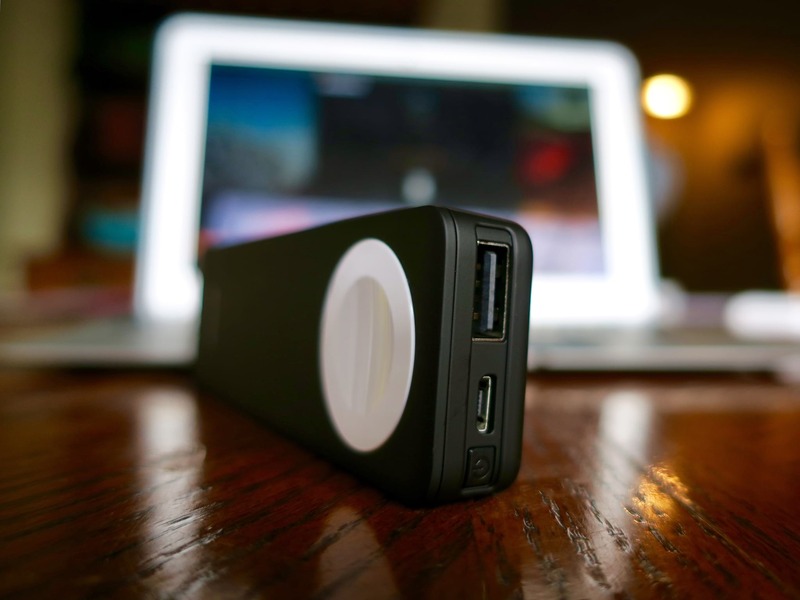 It doesn’t offer the largest capacity, it doesn’t have multiple USB ports, and it charges over Micro-USB. But it offers a unique feature that helps it stand out amongst a sea of competitors. It features a great balance of capacity and physical size giving you a fair number of charge cycles without having to sacrifice too much space in your bag. If you’re an Apple Watch enthusiast looking for an external battery pack for travel, the Zens is a fantastic option.